You think the insane flow of politics in your newsfeed, on your TV and lighting up your iPhone will slow when the Trump Show ends? Think again: Media companies are doubling down on even more politics, to generate even higher ratings and more clicks, as audiences seems to crave all politics, all the time. This is your life on politics. 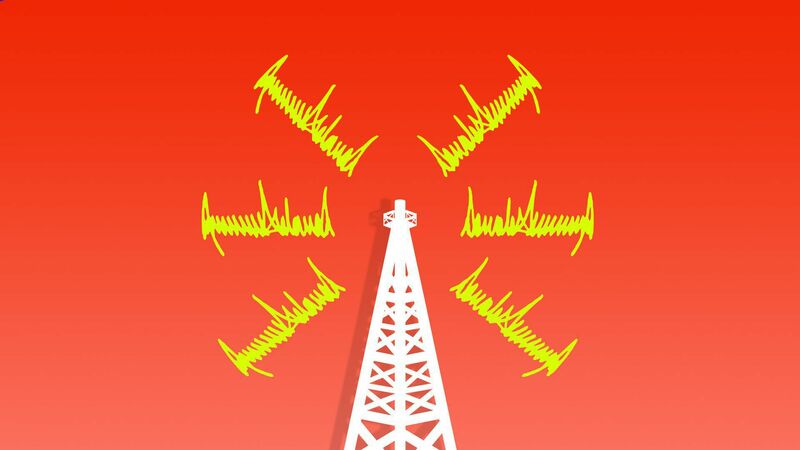 Axios' Sara Fischer explains why it's happening: Over the past two years, media companies have enjoyed high ratings and engagement from Trump coverage. And for some, it's at a relatively low cost: Networks and pundits can mostly cover speeches, rallies and tweets from their newsrooms. At the other end of the spectrum, the New York Times, Washington Post and a few other organizations have made record investments in time-consuming investigative reporting. Why it matters: Now that a precedent has been set around these high returns, it's unlikely news outlets will cut back — meaning that the barrage of political content being created and absorbed during the Trump presidency will likely outlive this administration. By the numbers: For the past 90 days, politics has held steady as the #1 most read about category of thousands of member websites within the database of leading traffic analytics company Parse.ly. Cable news networks have seen record ratings, even higher in some select cases than their broadcast counterparts during major events. The Kavanaugh confirmation, for example, was Fox News' most-watched Saturday primetime since the 2003 Iraq War. MSNBC and CNN are in an arms race to beef up their investigative and political teams. A.J. Katz, editor of TV Newser, tells Sara: "MSNBC was for a long time a middle-ranked cable network. It was in the top 25-30 in terms of Nielsen ratings for total audience. Now in recent months and years — ever since the advent of Trump — it's now become the top two or three basic cable network in terms of total audience. That bump in just a few years is extraordinary." National newspapers and magazines are already staffing up for 2020 with some of their biggest field teams yet. The Washington Post is looking for six reporters and an editor to expand coverage of the 2020 presidential election, it will announce today. It's the paper's biggest presidential coverage team ever. The Atlantic, L.A. Times and others are all staffing up. Politico, which didn't exist a dozen years ago, has six White House reporters alone — and is hiring. The Trump effect: The president's ability to attach himself to so many broad topics online, (mostly by tweeting so much), has pushed many apolitical topics, from sports and finance, to become political. Even children's books have fallen to the political drama that is the Trump era: Stephen Colbert's children’s book that he made out of Trump’s post-Hurricane Florence comments has been sitting in the top 10 on Amazon since it was announced — and it’s currently #1. John Oliver's book about Mike Pence's rabbit, "A Day in the Life of Marlon Bundo," has had consistent sales since release, and is still in the top 50 children's books ranking on Amazon. The bottom line: We are living in an era of unprecedented political drama. And data show that Americans are craving more of it. The Democratic Congressional Campaign Committee raised $400,000 from emails and texts in the 30 hours after Christine Blasey Ford's testimony. Sen. Kamala Harris (D-Calif.) raised over $400,000 for Sen. Heidi Heitkamp of North Dakota (who voted against Kavanaugh) in 24 hours from a single email, per NBC's Kasie Hunt. ActBlue — the online fundraising platform that has raised over $1 billion for Democrats this cycle — raised nearly $10 million on Oct. 5 and another $9 million on Oct. 6. The group says those were its third- and sixth-biggest fundraising days. The National Republican Congressional Committee says it saw a 418% increase in online donations in the first week of October compared to the first week of September. One Republican strategist who's working on midterm congressional campaigns said: "Sure, Kavanaugh is animating white, college-educated women, but guess what? They were not voting for a Republican a month ago and they’re still not." "Something of enormous global significance is happening almost without notice." As of September, "just over 50 percent of the world’s population, or some 3.8 billion people, live in households with enough discretionary expenditure to be considered 'middle class' or 'rich.'" Why it matters: "So September 2018 marks a global tipping point. After this, for the first time ever, the poor and vulnerable will no longer be a majority in the world. Barring some unfortunate global economic setback, this marks the start of a new era of a middle-class majority." When SpaceX launched a rocket carrying an Argentine Earth-observation satellite from Vandenberg Air Force Base on California's Central Coast, both the night sky and social media lit up, per AP. People as far away as San Francisco, Sacramento, Phoenix and Reno, Nevada, posted photos of the Falcon 9 rocket's launch and return on Sunday night. 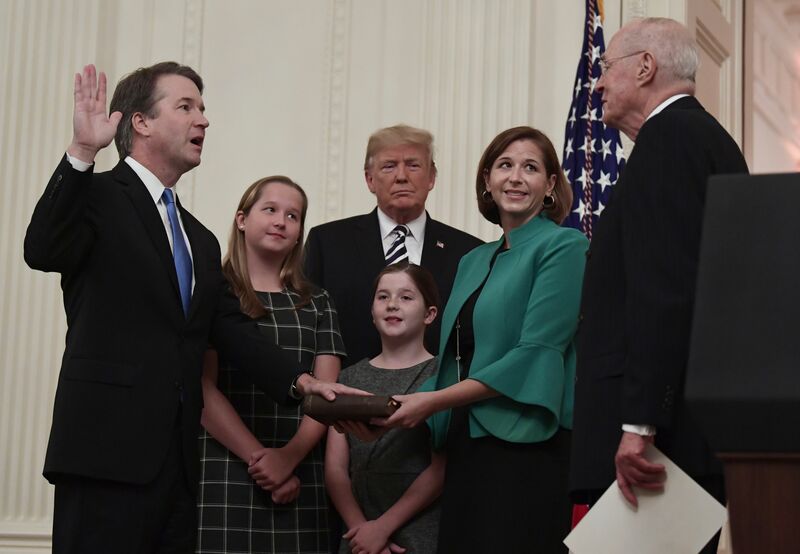 Retired Supreme Court Justice Anthony Kennedy ceremonially swore in Supreme Court Justice Brett Kavanaugh in the East Room last evening. He was joined by his wife, Ashley, and daughters Margaret (left) and Liza. 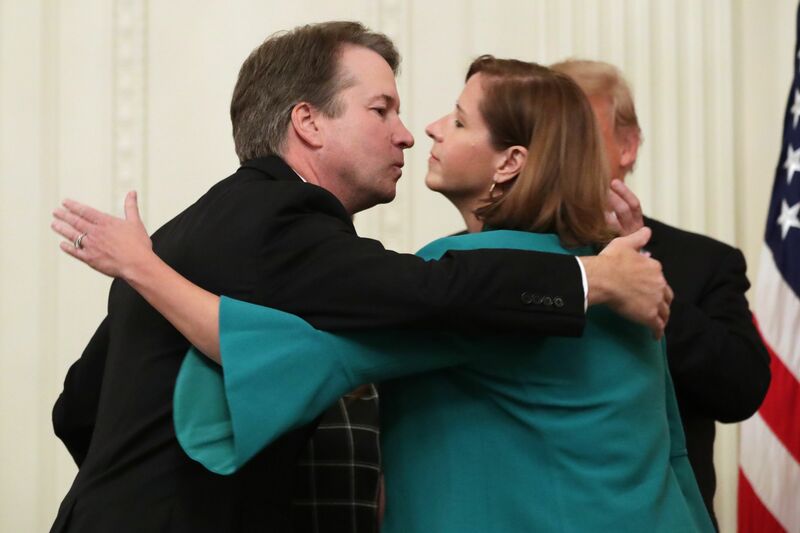 President Trump: "On behalf of our nation, I want to apologize to Brett and the entire Kavanaugh family for the terrible pain and suffering you have been forced to endure." 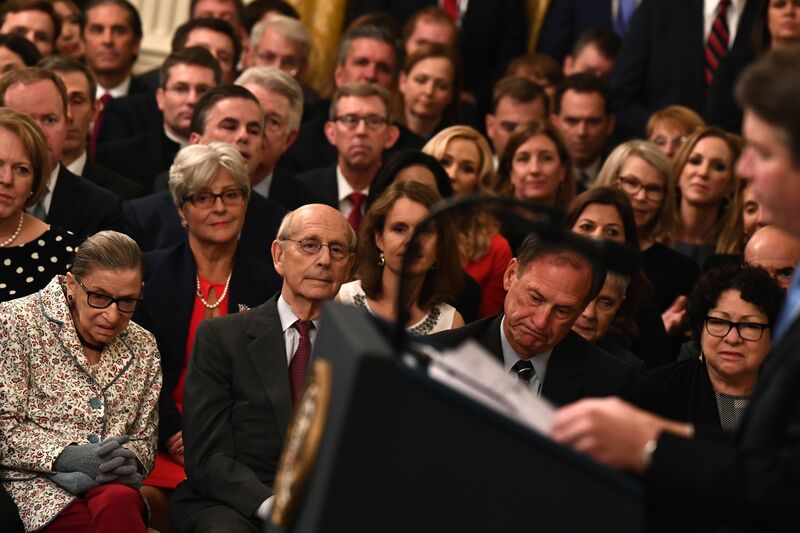 Below, Justices Ruth Bader Ginsburg, Stephen Breyer, Samuel Alito and Sonia Sotomayor listen to Kavanaugh. Google permanently shut down the consumer version of Google+ yesterday after The Wall Street Journal reported that Google exposed the data of roughly 500,000 Google+ users this past spring, but didn't disclose the issue. Google was worried that doing so would cause regulatory scrutiny and would lead people to compare the situation to Facebook's Cambridge Analytica saga. Axios' Sara Fischer reports that this incident may be the last time a major tech company can get away with hiding something like this for months. That's because of sweeping privacy laws that the EU began enforcing in May. Be smart: Despite hearings and investigations into data privacy issues, analysts don't foresee privacy regulation being passed by Congress soon. But pressure from the EU to pay more attention to the data practices of big firms is forcing the U.S. to take notice about all sorts of issues around Big Tech. Regulation around content moderation on these platforms seems to be stalled in the U.S., despite high-profile congressional hearings on bias against conservative viewpoints. The bottom line: There's a vicious circle of uncertainty happening around innovation and regulation, and tech companies are caught in the middle of it. Directed and produced by Emmy winner Matthew O’Neill (HBO’s "Baghdad ER") and Perri Peltz (HBO’s "Remembering the Artist Robert De Niro, Sr."), the show will highlight the week ahead in politics, business and technology — and other topics shaping the future. Each edition of "Axios" will feature documentary shorts, fascinating interviews, and trustworthy insights delivered in Smart Brevity. 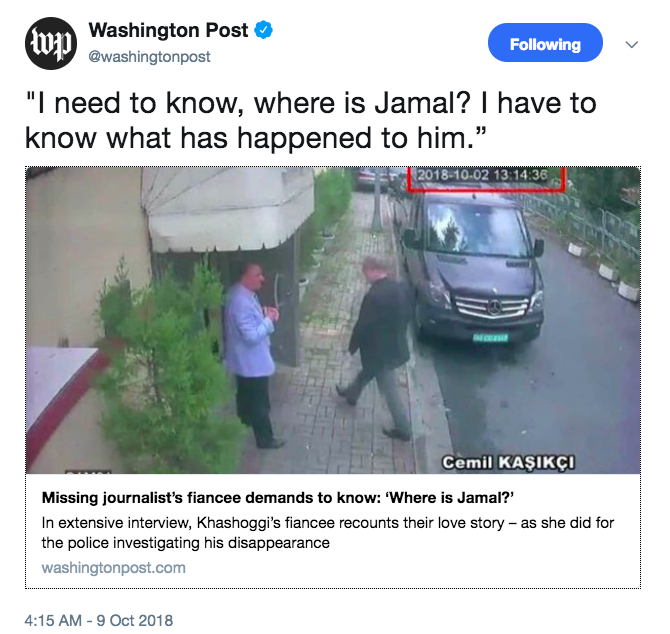 The Washington Post published a surveillance image (above) showing its missing Saudi contributor, Jamal Khashoggi, walking into the Saudi Consulate in Istanbul a week ago, just before he disappeared, per AP. Turkish officials believe the writer was killed inside the consulate by a 15-member "murder" team sent by the Saudi government. "Khashoggi has written extensively about Saudi Arabia, including criticizing its war in Yemen, its recent diplomatic spat with Canada and its arrest of women's rights activists." "All those issues have been viewed as being pushed by Prince Mohammed, who similarly has led roundups of activists, businessmen and others in the kingdom." Read excerpts from his writing. Hillary and Bill Clinton announced a concert-style tour hitting four cities in the U.S. and Canada in November and December, and nine in April and May. 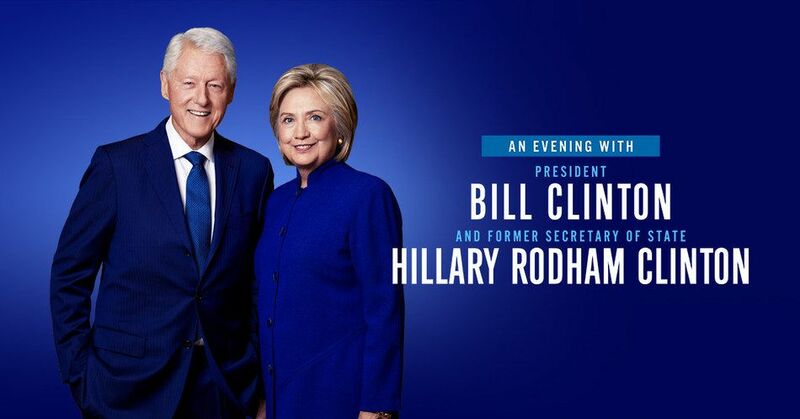 The couple will share "stories and inspiring anecdotes that shaped their historic careers in public service, while also discussing issues of the day and looking towards the future," per a Live Nation release. For the May 4 stop at The Forum in Inglewood, Calif., tickets range from $59.50 to $375.00. Tickets go on sale Friday at 10 a.m., local time. See the list of stops. 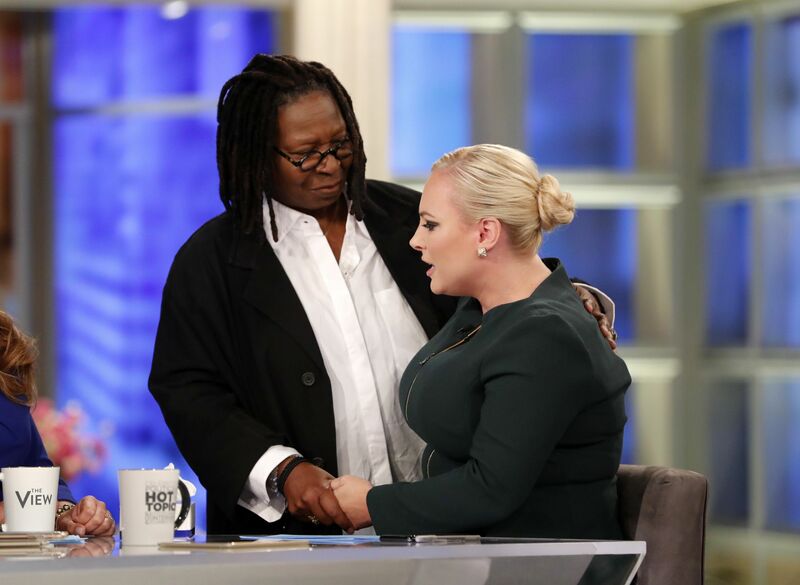 Fellow co-host Whoopi Goldberg comforts Meghan McCain as she made a tearful return to ABC's "The View" for the first time since her father's death in August. "President George W. Bush and Mrs. Laura Bush are delighted to announce the marriage of their daughter, Barbara Pierce, to Mr. Craig Louis Coyne," Bush's office announced. "The couple exchanged vows in a private family ceremony at Walker’s Point in Kennebunkport, Maine, on Sunday." "The bride ... is co-founder and Chair of Global Health Corps. The bridegroom ... is a screenwriter. The couple will live in New York City." Brian Conklin of USAA will join as vice president of U.S. government affairs and Christin Tinsworth Baker of Ford will be director of public affairs, reporting to Ziad Ojakli. 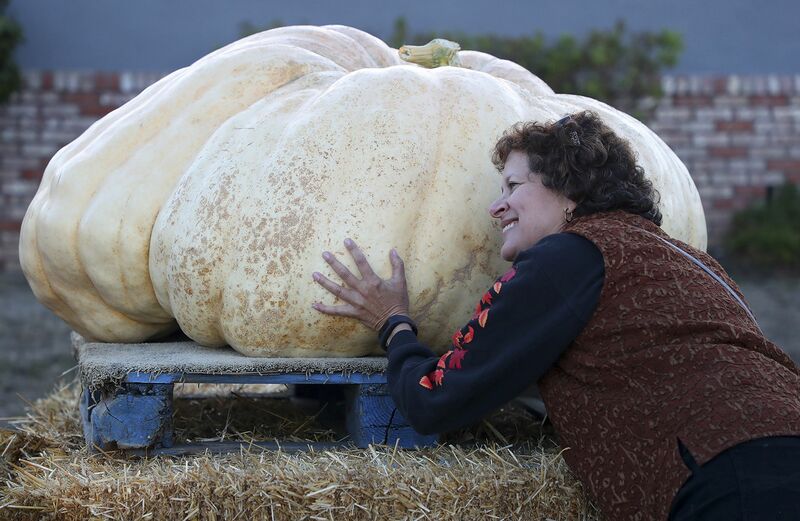 "One special seed" and months of care by an Oregon commercial pilot produced a 2,170-pound pumpkin that won a global weigh-in in northern California, the fourth time his gargantuan plants were awarded top honors, per AP. Steve Daletas, 58, of Pleasant Hill, Oregon, needed a backhoe to place his massive pumpkin on a pickup truck. He strapped it down and drove under the speed limit for 12 hours to the contest in Half Moon Bay. Steve's great pumpkin was far from a U.S. record. That was set last month when a grower in New Hampshire produced a pumpkin weighing more than 2,500 pounds. The record for heaviest pumpkin in the world was set by a Belgian last year at a competition in Europe: over 2,600 pounds.